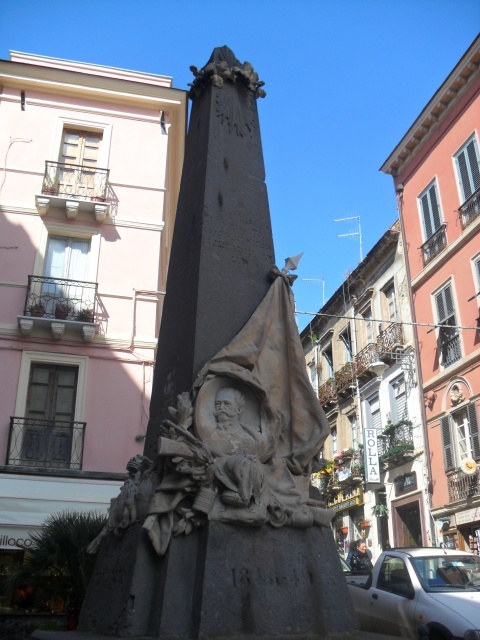 Commemorative monument dedicated to the Sardinian victims of the Independence Wars, made in 1886 by the Piedmontese sculptor Giuseppe Sartorio (1854-1922). Dedicated to the Sardinian victims of the Independence Wars, the monument has been inaugurated in the summer of 1886. Made by the Piedmontese sculptor Giuseppe Sartorio, the work has the look of an obelisk with a square base, with a laurel wreath on the top and, in the base, decorated with rifles, cannons and other objects used in war. On the four sides are reported dates and places of the main wars of the Risorgimento, and also the names of the Sardinian soldiers , who sacrificed their lives for the unification of the country. In the front, it is possible to see the italian flag and the portrait of Vittorio Emanuele II, first king in the unified Italy, who reigned from 1861 to 1878.